Preheat your oven to 350 degrees. Line a 9x13 inch baking pan with parchment paper. You can also line it with aluminum foil (be sure to spray the foil with nonstick spray). Or you can just spray the pan. In a medium pot (I use a 3 quart saucepan), melt 2 and 1/2 sticks of butter over medium heat. Yes, 2 and 1/2 sticks. I called these the best brownies of all time, not healthy brownies! Stir the butter occasionally. See photos for how to brown butter. It will turn white on top, then it will foam up. Once it is foamy, it will start forming brown colored milk solids or "bits". They will swirl up when you stir. The scent of the butter will change to a "nutty" or toffee like aroma. Once you see brown bits, remove the pan from the heat. Immediately add 4 ounces of unsweetened baking chocolate. Break it up into pieces so that they melt faster. Stir until it is melted all the way. Add 2 and 1/2 cups sugar and stir it together. If there are still bits of chocolate that have not melted, put it back on the burner on low until it is smooth. Add 1/2 teaspoon salt, 1 tablespoon water, and 2 teaspoons vanilla. Stir it together. Stir in the eggs one at a time, making sure each egg is fully incorporated before adding the next one. Do not over mix. Over-mixed batter makes for a tough brownie, which is not what we're going for. You want soft, tender brownies! Once that last egg has been mixed in thoroughly, stop messing with it. Scrape the batter into the prepared pan and spread to the edges. Sprinkle 1 and 1/4 cups chocolate chips evenly over the batter. Use your spatula to gently fold it in. If you add the chocolate chips to the batter before pouring it into the pan, they tend to melt and swirl on you. Which might be okay with you. I prefer my chocolate to stay in chip form so that when you bite into a brownie you get tiny little pools of chocolate. Mmm. Bake at 350 for about 25 minutes. The edges should be set. The center of the pan should not wobble when you shake it. I always do the toothpick test: poke a toothpick in the center of the brownies and if there is no wet batter sticking to it, it's done. (If there is, leave it in for a couple more minutes) Be sure to poke a couple times so that you know you're not poking into a melted chocolate chip. Every oven is different, so you are going to have to use your bet judgment here on the bake time! Do NOT over bake, or the brownies will be too dry. In my opinion, slightly under baked is better than under baked. Keep in mind that the brownies will firm up as they cool. When the brownies are done, remove from the oven and let cool as long as you can before giving in and trying a piece. To cut these into nice looking squares, once the brownies have cooled, lift the parchment paper or foil out of the pan. Cut with a sharp knife, wiping the knife on a clean wet towel in between slices. These are almost impossible to eat without a glass of milk. *You can also use 1 and 1/2 cups unsweetened cocoa powder! I often make them with cocoa powder. **I know brownies don't usually call for water. This recipe has water to replace some of the liquid lost in browning the butter. 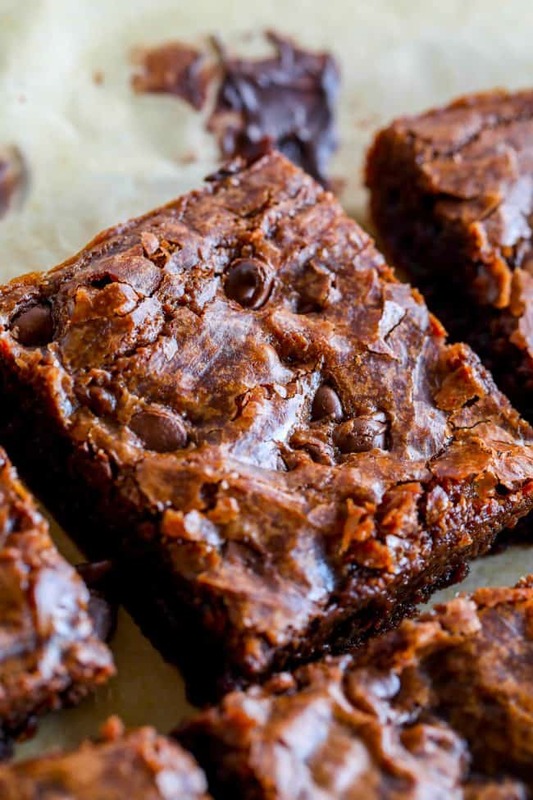 ***Most brownie recipes call for adding the eggs first, then the flour. I like to add the flour first so that the batter has a chance to cool down a bit more. I don't want to risk curdling my eggs! And I'm super impatient and don't like to wait. But if this feels weird to you, just wait a few minutes for the batter to cool some more before adding the eggs one at a time, then stir in the flour afterward, until barely incorporated. Source: adapted from Something Swanky.